Bloomberg has an absolutely terrific piece of reporting out today about how the big banks have mobilized to water down the Volcker Rule—the reform measure designed to prevent federally-backed banks from placing bets for their own bottom line. To make their case in Washington, banks and trade associations have been pressing a coordinated campaign to get regulators from five federal agencies to scale back the draft of the proprietary-trading rule issued in October, according to public and internal documents and interviews. They recruited money managers, industrial companies, municipal officials and foreign governments to their side. Knowing that they were tainted by bailouts and vulnerable to charges they were trying to preserve excessive profits, the banks looked for other firms to help press the argument. That’s what made Robert Auwaerter such a valuable ally. Auwaerter, who manages $650 billion as head of the fixed income group at mutual fund company Vanguard Group Inc., was in attendance on a day in early February, shortly after the Super Bowl, when Credit Suisse invited Democratic congressmen to its New York office for a presentation on the Volcker rule. 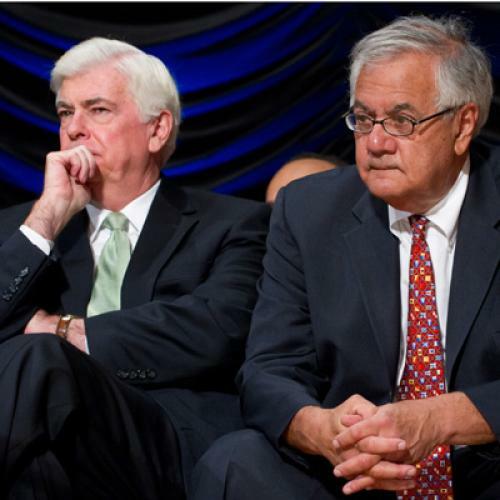 Almost all Republican lawmakers already opposed Dodd-Frank. Banks would have more sway with regulators if they could show bipartisanship. They turned to a group of House members known as the New Democrats for their centrist and pro-business leanings. If forced to choose, I’d say “think of the teachers and cops” is my favorite argument in the history of special pleading. It’s the absolute last refuge of weak-kneed congressmen and the moneymen whose bidding they do. The argument goes as follows: Because public pension funds, which partly fund the retirement of government employees like teachers and cops, engage in financial transactions, anything that makes those transactions marginally more expensive is an assault on the dignity in which our cherished public servants can live out their golden years. What I love about this argument is two-fold. First, it’s almost infinitely expandable. When you tally up all the public pension-fund money in this country (to say nothing of the private-sector pension funds the New Democrats tossed in for good measure), you’re easily talking tens of trillions of dollars. Which means that, if you take any financial transaction or financial asset imaginable, it’s highly likely that some pension fund somewhere has been a party to it (in the case of transactions) or owned it (in the case of assets). If you live in Washington, for example, you may have noticed ads in recent months urging Congress to back off oil and gas companies for the same reason—too many Americans depend on these companies via stock their pension funds own. But there’s no need to stop at bank regulations or oil and gas companies. Tobacco makers, pharmaceutical manufacturers, weapons designers, casinos—all these industries can claim the same defense if they choose to (and almost certainly have at one point or another). Which brings us to the second great feature of this argument: It’s pure bunk. Given the trillions being invested, it’s extremely unlikely that any one regulation in any one industry—even the financial services industry, which plays a central role in investing pension money—would have more than a tiny effect on the retirement income of the average teacher or cop. The Volcker Rule, for example, wouldn’t affect the trillions of dollars the pension funds invest through hedge funds, private-equity firms, venture-capital firms, mutual funds, etc., since, unlike big banks, none of these firms are subject to the Rule’s proprietary-trading restrictions. In fact, when you take into account the risks the Volcker Rule is designed to check, it’s almost certainly a net positive for the average teacher or cop. On the minus side is the extremely marginal potential drop in pension income. On the plus side is the vastly diminished risk that these same teachers and cops will pay more in taxes to bail out a federally-backed bank. So, contra the New Dems, it seems like a pretty damn good deal! The banks won major concessions on nearly every element [of financial reform] they’d fiercely resisted. … The real culprits tended to be the New Democrats in the House. … But Geithner also worked behind the scenes to ensure that some of the same reforms he’d endorsed publicly turned out weaker than advertised. The Volcker Rule was a prime example. The rule’s two biggest champions in the Senate, Democrats Carl Levin of Michigan and Jeff Merkley of Oregon, sought to spell out, in the text of the bill, which types of speculative bets would be off-limits to government backed banks. Geithner preferred to let the regulators come up with this standard. At first blush, this sounded like a trivial difference. But Congress’s impartial research arm, the Congressional Research Service (CRS), worried that neglecting to write the rule into law, as Levin and Merkley proposed to do, could allow a future regulator to disregard it entirely. As one Senate aide involved in the back-and-forth observed, “If a strong restriction is put in place this year, and twenty years from now a regulator guts it, they [CRS] think it’s possible that a court could uphold the gutting of it.” And that’s assuming that the regulators wrote a tough rule in the first place. There was no guarantee this would happen. The trouble with investing so much power in regulators is that they’re far more insulated from public opinion, and therefore susceptible to the blandishments of industry officials, than even the most out-of-touch congressperson. [emphasis added]… Yet Geithner rejected the idea that the regulators were destined to blow it. In his preferred narrative, the regulators had often succeeded when they had had the right tools and the proper jurisdiction. Though Geithner conceded that regulators had made mistakes, the problems arose where they hadn’t had these advantages. “The failures in the financial system that made this crisis so devastating were largely failures . . . where the Fed had no authority” and no other regulator knew who was in charge, he said.